motorists traveling east-west on Saginaw are often driving in excess of 50 mph. because of the heavy traffic on Saginaw, drivers become impatient while waiting to turn onto Saginaw from Broadbent, and while waiting to turn onto Broadbent from Saginaw. the intersection does not have a traffic signal. Statistics show just how frequently accidents happen at the Saginaw Broadbent intersection. In 2016, there were 18 motor vehicle collisions where Saginaw and Broadbent meet. This is an increase of 7 crashes over 2015, which saw 11 accidents. a total of 50 people were involved. 3 crashes happened when drivers were trying to make a left turn from Saginaw onto Broadbent. 6 crashes happened when drivers were approaching Saginaw from northbound or southbound Broadbent. 14 crashes caused property damage. 15 crashes occurred during weekdays. Pulling onto Saginaw from Broadbent can be risky and requires focus, patience and skill. Positioned near the I-96 and I-69 interchange, Saginaw is a bustling highway that hosts numerous restaurants, gas stations, stores and hotels. One primary reason for the rise in Saginaw Broadbent accidents is that the heavy traffic on Saginaw creates frustration and confusion for motorists, especially drivers attempting to turn onto Saginaw from Broadbent. Entering Saginaw from either north or south Broadbent requires focus, patience and skill, as the traffic is approaching quickly and drivers must wait for an opening. The same is true for motorists wanting to turn either left or right onto Broadbent from Saginaw. Crossing the busy traffic on Saginaw to enter Broadbent requires focus, skill and patience. let drivers safely make a turn onto Saginaw from Broadbent. let motorists safely make a turn onto Broadbent from Saginaw. reduce the number of drivers who pull onto Saginaw from Broadbent and then sit in the middle lane, waiting to merge with the flow of Saginaw traffic. A traffic signal at Saginaw and Broadbent will help reduce the number of car accidents in this dangerous area. 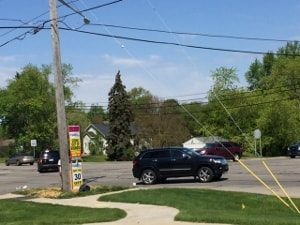 In February 2017, the Michigan Department of Transportation (MDOT) once again denied funds to Delta Township to install a traffic signal at Saginaw and Broadbent. According to MDOT, a signal cannot be installed until Broadbent is widened. Recognizing the need for a traffic light, Delta Township and the Eaton County Road Commission have agreed to split the cost of widening Broadbent. Road work is slated to begin in summer 2017. MDOT has indicated that it plans to install a traffic signal at the Saginaw and Broadbent intersection, once Broadbent has been widened, tentatively in the fall of 2017. But before the traffic signal is introduced, a stop sign and blinking red and yellow lights will be installed, so drivers can become familiar with stopping at the intersection — something they are currently not used to doing. We are pleased that the dangers of the Saginaw Broadbent intersection have been recognized and that a traffic signal is scheduled for installation. 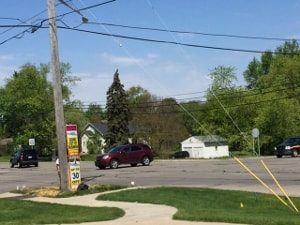 This is a step in the right direction for reducing the number of accidents at Saginaw and Broadbent, thereby making the road safer for Michigan motorists. If you’ve been injured in a motor vehicle accident at Saginaw and Broadbent in west Lansing, or anywhere in Michigan, the Sinas Dramis Law Firm can help protect your right to no-fault PIP benefits and any other compensation to which you may be entitled. Contact our Lansing car accident lawyers or Grand Rapids auto accident attorneys today.